4-Week Pool Comfort Course | Mediterra - Swim & Run Better Than Ever! Finally, feel at peace and in control in the pool. 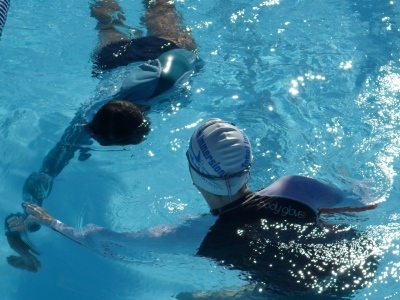 Enjoy patient, gentle, skilled guidance to help you gain comfort and confidence in the water. Two 30-minute lessons per week, for four weeks. If these dates and times are not suitable for you, you may consider arranging a private Pool Comfort 3-Lesson Series with one of our instructors. Enjoy our gentle method to remove fear and acquire the skills that will increase your safety and ease in the water. Discover how to float, submerge, breath, move, turn, roll and make your way peacefully along the surface. Bring a friend or two to form a training group! Lessons will be on Monday and Wednesdays, 1:15 pm to 1:45 pm, 30 minutes long. 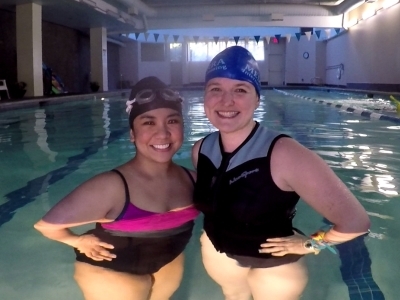 This course is intended for those who experience strong fear or anxiety in water, who have a hard time submerging the face underwater, and for those who would like to feel more comfortable in the water before taking full swim lessons. This course is recommended for those who would like to take the aqua fitness course, but are not comfortable yet in taking feet off the floor of the pool or submerging your face underwater. This course will prepare you to safely handle those likely situations in the pool. Lessons are 30 minutes in pool, starting promptly.